Principal investigators, financial managers, and core administrators may dispute line item charges on invoices. A charge can be flagged for dispute as long as the invoice has not been paid and as long as the billing file has not been sent to the institution's financial system. Core Admins can review the dispute and make adjustments to the line charge, if necessary. 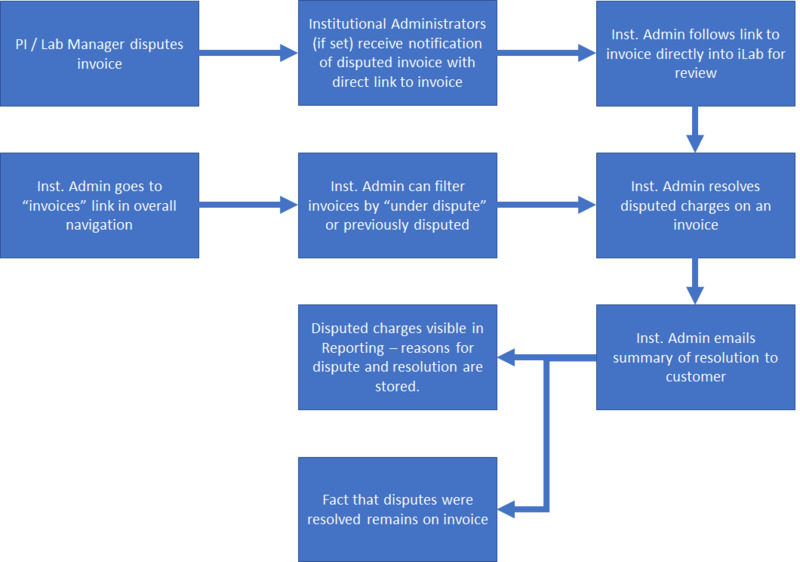 Finally, the dispute process offers the ability for institutional administrators to require a formal, valid reason for dispute as well as a formal, valid path to resolution. The available reasons and resolutions for dispute can be configured by central administration for streamlined reporting and data analysis. View the invoice by selecting the magnifying glass icon to the far right. You can also follow the link in your email if you received an email asking for review. 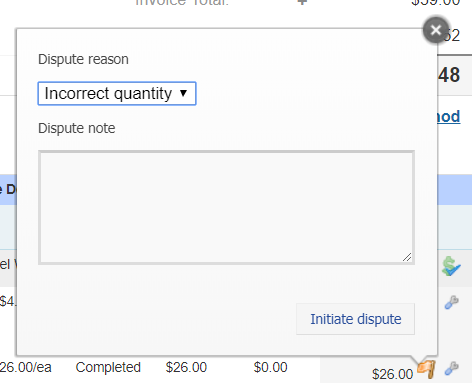 To select a charge for dispute, hover over an individual line charge to view the orange Invoice Dispute flag. Click on this orange flag to initiate the dispute process. A pop-up window will display, with a drop down list of possible dispute reasons. Select an appropriate reason and click Initiate Dispute. Once a dispute has been initiated, all selected contacts will receive an email notification of the disputed invoice with a direct link to invoice. The orange flag will remain with a note indicating this charge is in dispute. To begin the dispute resolution process, click on the orange flag in the invoice. A pop-up window will display with the original dispute details as well as options for addressing the dispute. Select an appropriate resolution option and click "Resolve dispute". Once a dispute has been successfully resolved by an institutional/financial administrator or core administrator, the orange flag will turn to green. 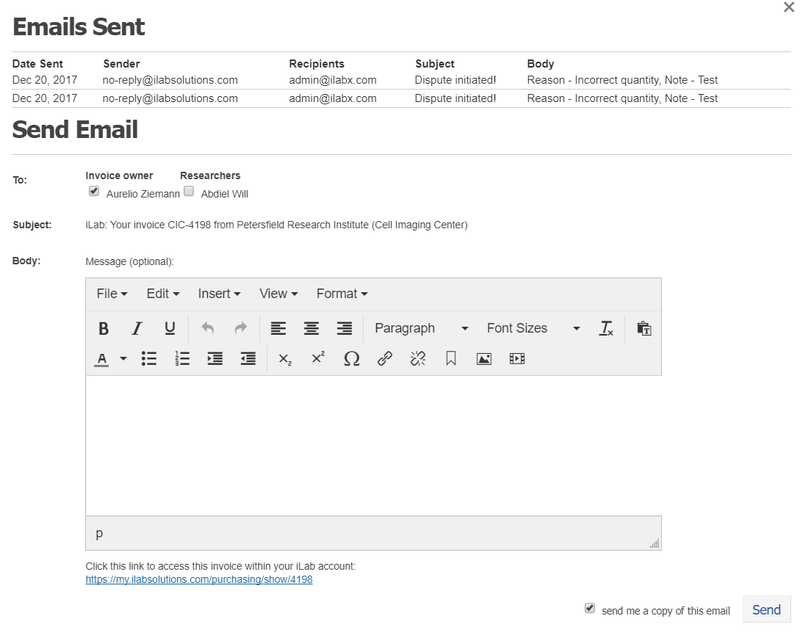 An email notification can now be sent to all appropriate contacts informing them that the invoice dispute has been addressed. Within the invoice view, select the Envelope icon at the top of the the invoice. The email wizard will open. Select who you would like to send the email to and add any personalized messages within the Message box, then click Send. 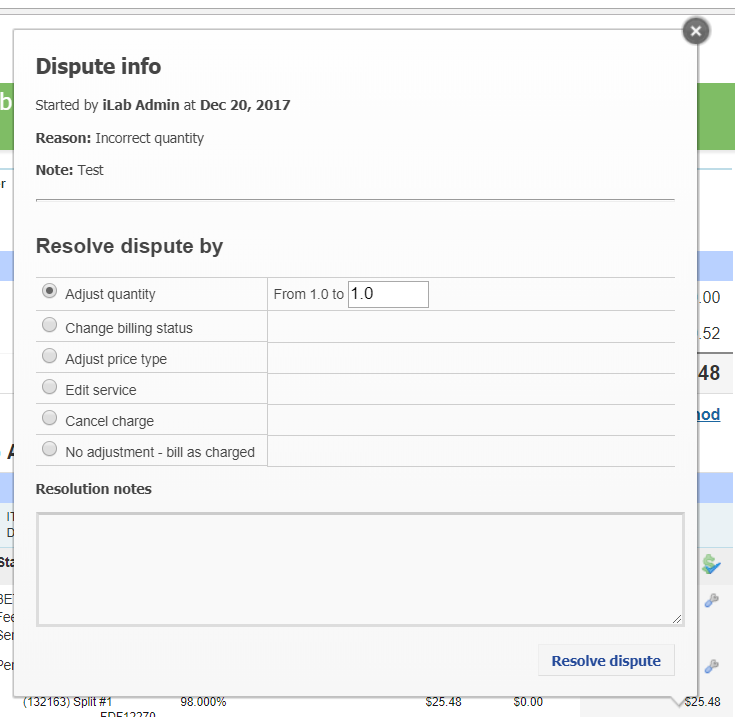 The filter tools may be used to identify and track any invoices currently disputed (Under Dispute) as well as invoices that were previously disputed but have been successfully addressed (Dispute Resolved). An orange flag indicates an invoice is disputed, while a green flag indicates the dispute has been resolved.